A man has gone on trial in Edinburgh accused of murdering his ex-wife by setting fire to her. Ahmad Yazdanparast denies killing Ahdie Khayatzadeh at Venus Hair and Beauty in Stirling on 12 October last year. The 61-year-old is alleged to have poured petrol or a similar flammable substance over her head and body and set fire to her. 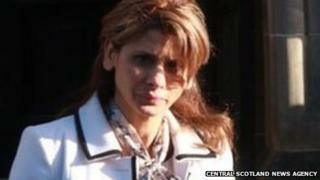 Ms Khayatzadeh, 46, later died from her injuries at Forth Valley Hospital. Mr Yazdanparast broke down and sobbed as his trial was shown CCTV footage of firefighters rescuing a woman from a hair salon. Smoke was seen coming from the basement premises in Stirling on the film screened to jurors at the High Court in Edinburgh. The judge, Lady Wise, pointed out that Ahmad Yazdanparast seemed to be very distressed as footage was shown and called a short adjournment in the proceedings before resuming evidence. Charity manager James Marshall, 27, told the court that he had been at a florist's shop when he saw a man coming up stairs with what looked like his chest on fire but that the flames had been extinguished. Mr Marshall went to check on him and asked his name. He said he was not responsive at first but told him his name was Chico. He said he had burns injuries to his hands, an arm and the skin on his forehead seemed to be peeling. He went into the property with another man and found a closed door with flames right up at it. He said he was screaming and shouting in a bid to check if anyone else was there. He said: "There was no response at all." "People on the outside were shouting on me to get back outside the property," he said. He returned to the premises a second time with another man. "People were shouting at us to come back because the fire brigade had just arrived at that point," he said. Advocate depute Tim Niven-Smith asked if he had gone back to speak to the man Chico. Mr Marshall said: "I asked him what had caused the fire and he said petrol." Another witness, Mathew Morris, told the court he had known Chico from buying kebabs from him in the past. The 31-year-old said he had seen a man with a jacket wrapped around his arm come up to the top of the steps before he fell over. Mr Morris then went over to the man and recognised him as Chico and noticed he appeared to have burns. He said a young man who had been next to Chico asked him if anyone else was involved and he replied a woman and they went to see if they could seen anyone. He later became aware of fire personnel attending at the scene and saw a woman being brought out with severe facial burns. Mr Yazdanparast has lodged a special defence maintaining he was acting in self defence.